The Robert-Laryn Skatepark within Treaty Park, is a fantastic place for the skateboarding enthusiast of all ages. They have a skate shop that is packed with all the essentials you will ever need to exceed in this sport. 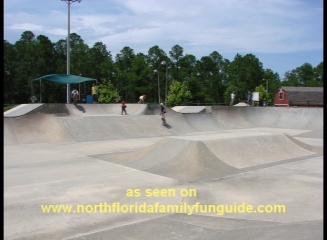 The skatepark has 28,000 sq. ft of concrete in the form of several bowls and dips and raised ledges, which makes a very interesting series of challenges for all skill levels. They even have a Little Dudes Park designed for beginner skaters or ages 12 and under to practice their skills. Bryan brought along his extra wide skateboard, and put on his helmet,gloves and kneepads, and had a blast rolling down the ledges in a seated position. The perfect beginner experience in a skatepark! He even had the chance to go to the big areas and take his turn rolling across the huge expansive concrete bowls with some friends he met. It was really fun to see the older guys fly around on those skateboards and practice their jumping and maneuvering skills! This is the best skatepark we have ever seen!